The compact, secure way to store multiple tablets. 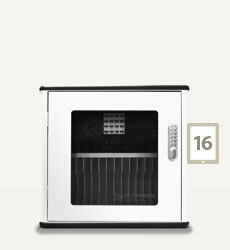 The Swiss Charging Cabinet for 16 Tablets is small but smart. 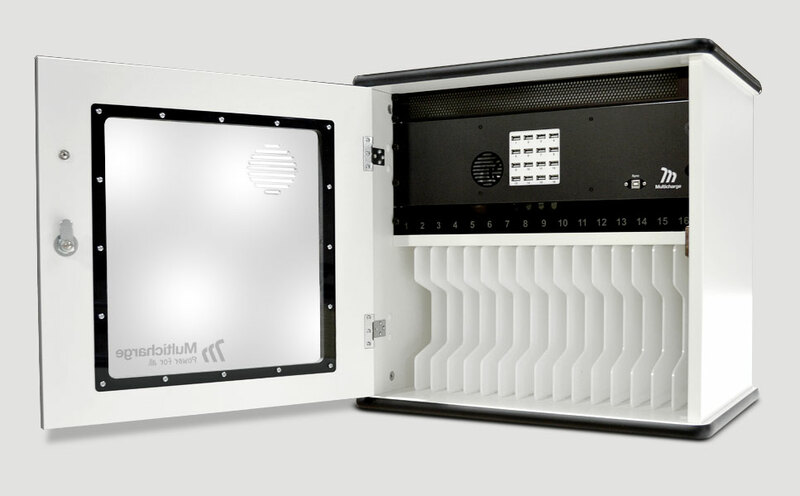 Charge and store up to 16 tablets inside one compact, elegant cabinet. 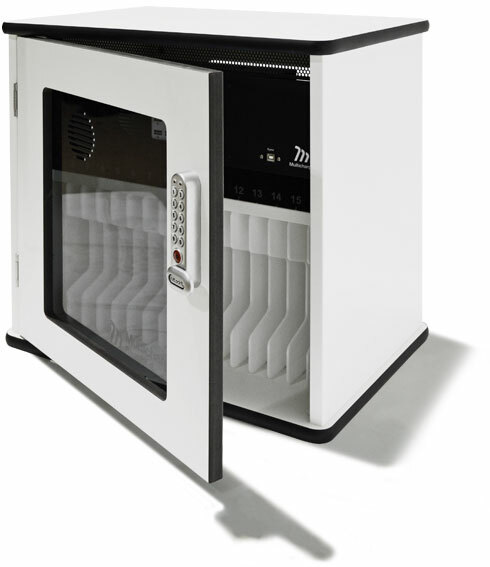 The Swiss Charging Cabinet lets you charge up to 16 tablets quickly and easily in one place. 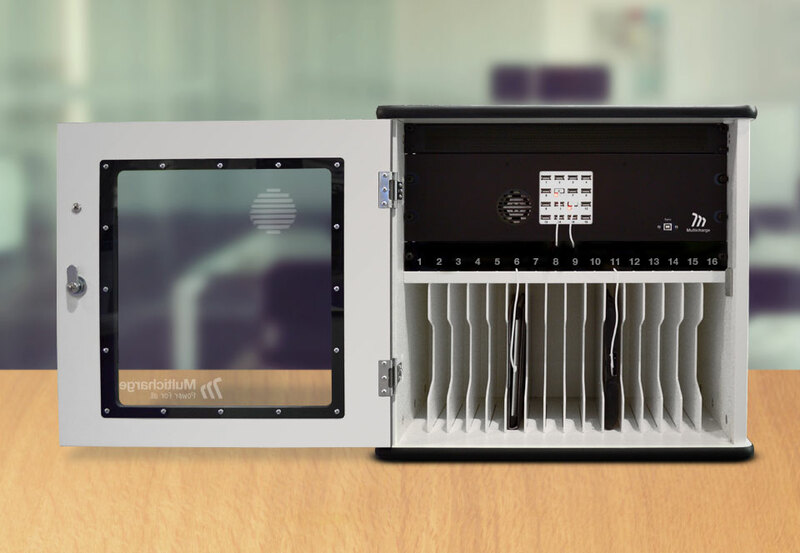 You can charge with the cabinet door open or closed, and all 16 tablets will be charged in about the same time as it would take to charge just one - meaning your devices can be back in use sooner than you expected. 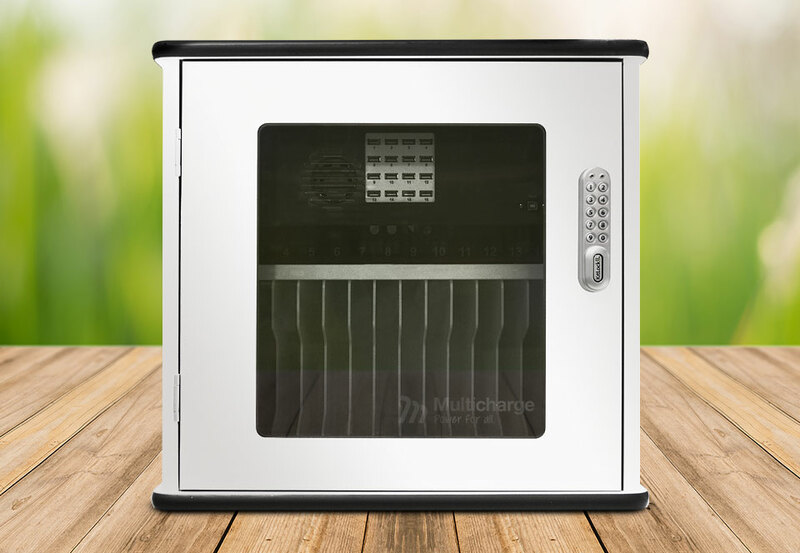 The cabinet is suitable for any USB-chargeable tablet up to 10 inches in size, so whether you have 16 iPads, 16 Samsung tablets or a combination of different models, you can charge them all at once and the full charging rate will be delivered to each device. 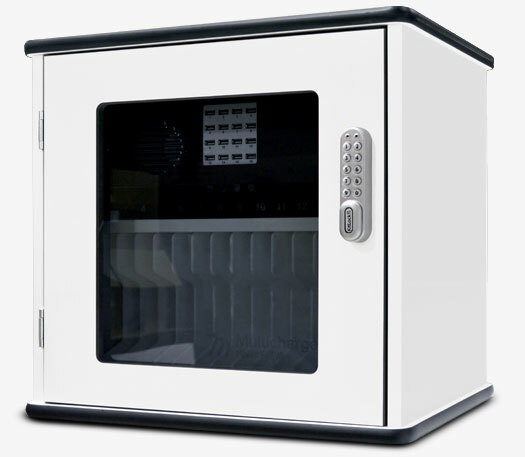 The compact and stylish Swiss Charging cabinet has been designed rather like an intelligent cupboard that fits seamlessly into almost any work or training environment. 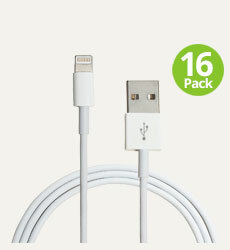 It can be either bolted to the wall or simply placed in a convenient spot on the desk or any other work surface that keeps it off the floor and easy to hand. There's no complicated set-up - just slide in and connect your tablets, plug the cabinet into a power socket and you're ready to go. 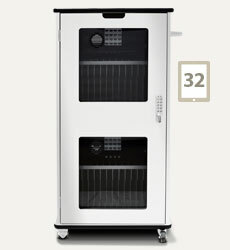 With such a small footprint, the Swiss Cabinet is an unobtrusive way to manage multiple tablets, making it ideal for hospitals, health centres, nursing homes, training environments, retail stores and more. 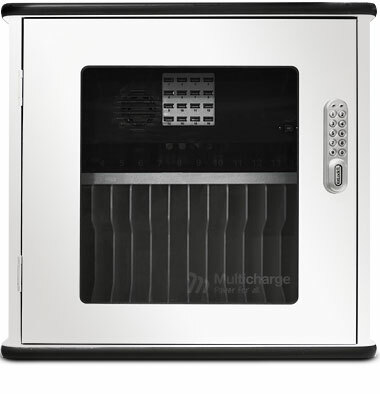 The Swiss Charging Cabinet from Multicharge is perfect for busy environments where security is important. 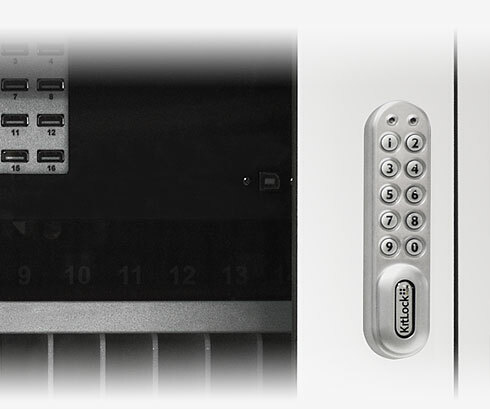 That's why every cabinet comes fitted with a digital lock, helping to keep your tablets safe and secure. 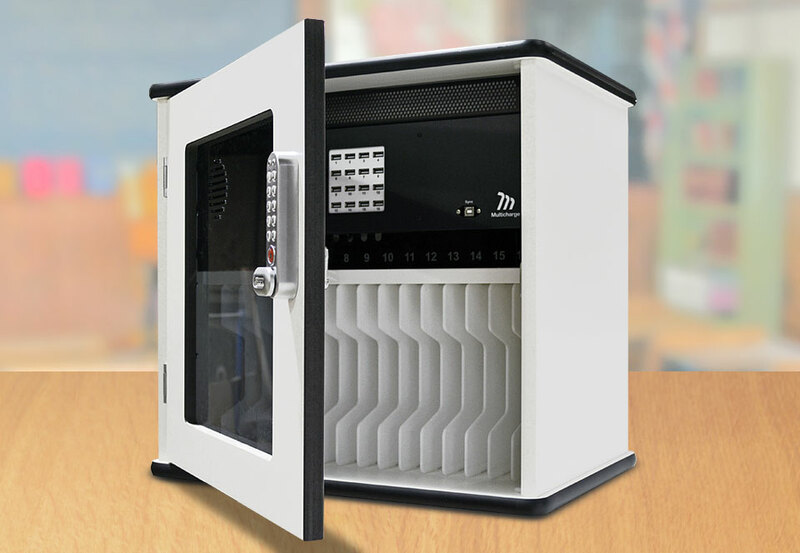 Tablets can be charged with the door open or closed, and for added security, the entire cabinet can be bolted to the wall. 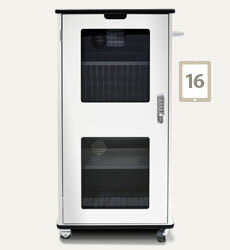 The Swiss Tablet Charging Cabinet comes in a beautiful white finish by default, however it can be supplied in a range of different colours and wood-grain finishes too. It can also be customised with a vinyl wrap, so if you are looking to promote your company or organisation, why not add branding graphics to make it truly unique. 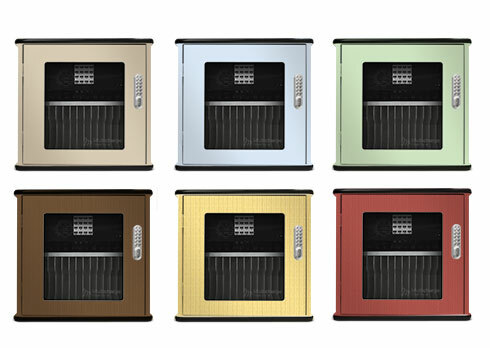 Custom colours, finishes and branding available on request. *If tablet covers are unusually large or have big handles, please let us know before you order.